Google Video is a web video search engine owned by Google Inc.Established in 2005, the service has transformed from being a video hosting / sharing site to being a search engine solely for searching web videos. Video uploading was terminated in 2009 and since then users are no longer able to upload videos on Google Video servers. During that time, users were allowed to upload videos up to 100MB but that is no longer possible now. Although video uploading was stopped, Google continued to host the videos. On 15 April 2011, the company announced plans to stop video hosting as well but they found out that instead of removing all the previously hosted videos on their servers, the best way is to transfer the videos to YouTube. YouTube is another Google owned service that was bought in 2006 by the search engine giant. Therefore if you have your videos on Google servers you don’t have to worry, you can automatically upload and transfer them to your YouTube account. Okay the fact is Google Video continues to exist but now as a video search engine. Unlike a video hosting site like YouTube, a video search engine scours the web for relevant videos and shows them in the search results. 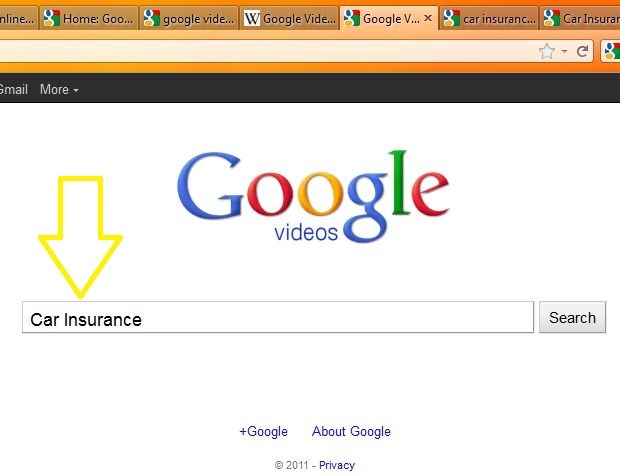 Google aggregates video search results from many sources such as YouTube, Facebook, MySpace, MetaCafe, CNN, Yahoo Videos, Vimeo, GoFish, DailyMotion, 5 Minutes, GameTubeNow and many more. These are videos that can be watched online or embedded on your website. Some sites many allow you to download the videos as well. You will find all types of videos in many categories – commercials, entertainment, educational, television show channels, music channels, news channels, humour, technology, viral videos and many more. To get results from a particular source, for example, videos from VideoJug.com only, click the “videojug.com” link on the bottom of the left sidebar under [Any source].The top 6 video websites will be shown on this sidebar, so you must choose the source that you want. 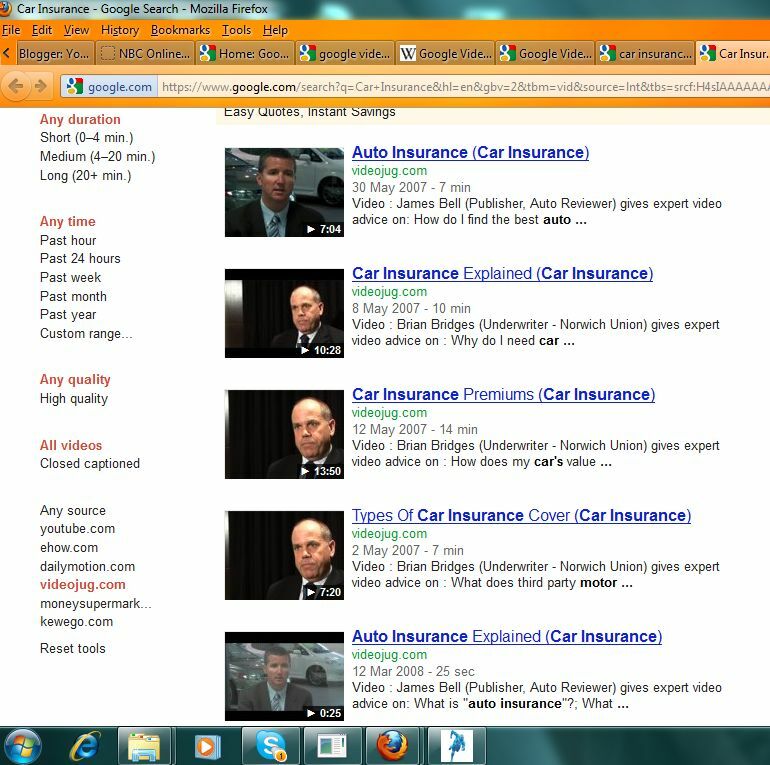 To get Google videos of a specific duration go to [Any duration] on the side bar. Here you can filter videos according to their duration – Short, Medium or Long. To get videos according to the type of quality, go to [Any quality] on the sidebar. To watch only high quality videos, click “High quality”. The Safe Search feature on the top right of the search results page allows you to filter out videos that are not “Family friendly”. 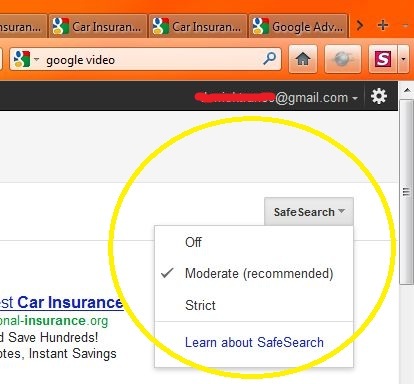 Just select the [Strict] option or [Moderate] option for family safe videos. The [Off] option will show you all kinds of videos in your search results without any restriction. 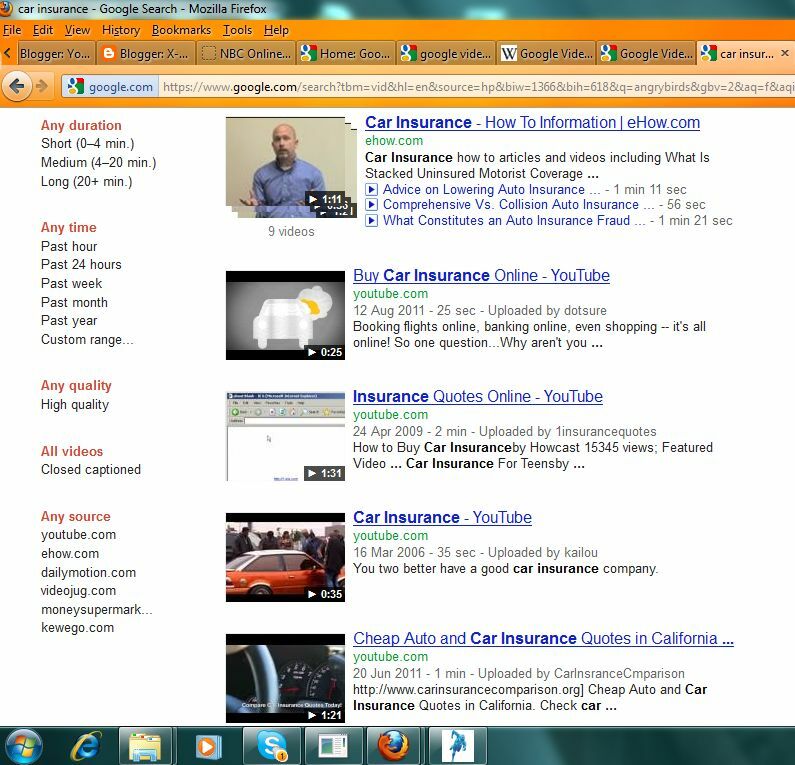 This feature can be accessed by clicking the [Advanced Search] link at the bottom left of the Google Video page. It gives you more parameters for narrowing down your search. Other than the search parameters available on the left sidebar, you can also search videos according to Language and Domain. 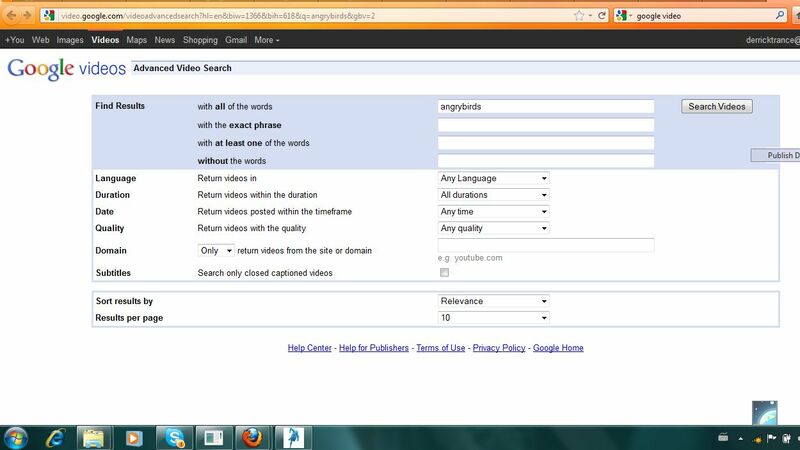 To search according to domain, type the address or URL of the website that you want videos from e.g. if you want videos from Facebook only, type facebook.com in the form and select [Only].You can also use this feature to filter out domain names e.g. if you don’t want results from Ehow.com, type ehow.com in the form and select [Don’t].Click [Search Videos] at the top right of the page to get the results. Advanced Search also allows you to find results by excluding or including certain keywords / phrases. The [Find Results] feature is prominently displayed at the top. You can find any videos you want on Google. When you are on Google Web Search, just navigate to [Videos] on the menu bar and you will be sent to the video search engine.